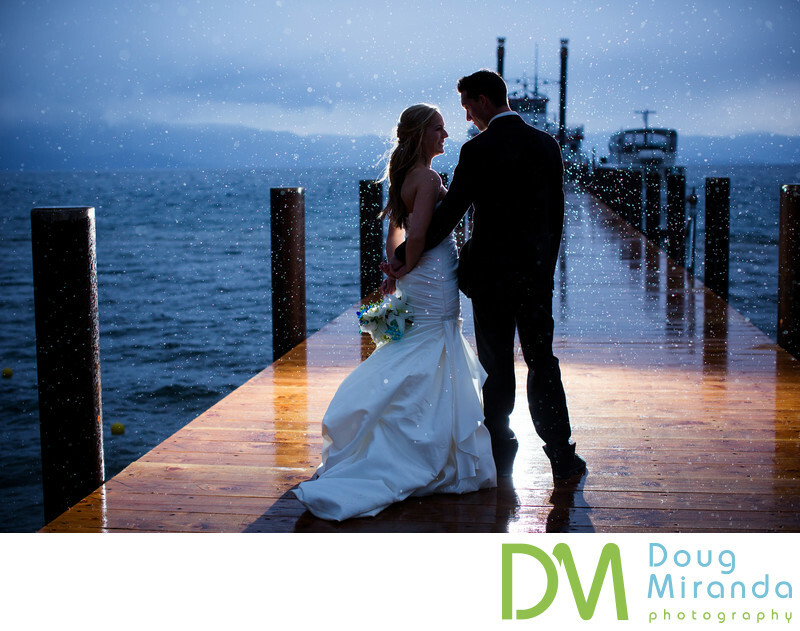 As a Lake Tahoe wedding photographer, you have to be ready for any kind of weather situation from rain, snow, wind, cold and hot temperatures during the span of a wedding season in the Tahoe Basin. Melissa and Matt’s wedding took place in the middle of May at Zephyr Cove Resort. The month of May is a hit or miss month with weather in Tahoe. You can have sunny blue skies with perfect temperatures to snow and lastly cold rain, which was the case on Melissa and Matt’s wedding day. When I arrived on their wedding day it had just started to rain and didn’t stop all day long. We were hoping that we would get a break in the weather for their ceremony, but that didn’t happen and the ceremony was held in the reception tent at Zephyr Cove Resort. Right after the ceremony we got our first break in the rain to shoot their family portraits, bridal party photos and a couple photos of the two of them before the rain moved back in. Melissa knew that it might rain on her wedding day and said she was fine with that and at some point wouldn’t mind taking some photos in the rain. After all the special events were done for the evening and it didn’t matter if Matt and Melissa got wet we went out from some last light portraits before it got dark. We lucked out again with the rain and got a break for about ten minutes. At that point we had ventured over to the pier to take those classic Lake Tahoe wedding pictures. Right when we started to take a couple of photos on the pier it started to lightly rain. At that moment I knew exactly what photo I wanted to take that’s been in my mind for years. I quickly ran over to my light stand and set my flash to the correct settings. I placed the flash directly behind them to backlight them and bring out the rain in the picture. I took one test shot and was ready to fire away. As I started to photograph them the light rain turned into a heavy down pour with in a couple of minutes. I ended up firing off about 20 photos before it was raining cats and dogs and we had to finally make a run for it back to the reception tent. In the end those photos were some of my favorites from their wedding day and ended up being one of their favorite photos too. So times you just have to risk getting soaked in the rain to get a phenomenal wedding picture for your clients. Location: Zephyr Cove Resort 760 US-50, Zephyr Cove, NV 89448. Keywords: Zephyr Cove Resort (225).